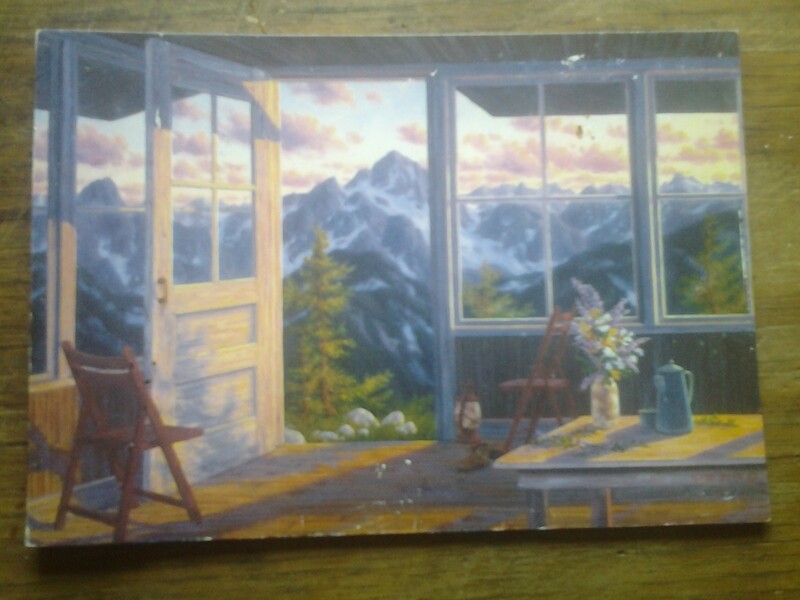 I have a picture post card which I have carried with me for years. It is a painting, a very simple one of the sort that might not be my favorite if it portrayed simply the vase or the chair but it became a treasure all the same. You see, the vase is filled with cut wild flowers, a few of which are still scattered on the table top, and the chair faces an open door. The late afternoon light streams in through the windows which face snow covered peaks to the west with clouds tinted orange and purple from the sunset. The beauty of the setting is enough to catch my eye but it is the serenity he captured which grasps my heart, it is everything I have always aspired towards and something I have yet to maintain. It isn’t that I have not lived it either, so I have and that is what tugs on me so severely as I know just how it feels! How many times have I sat in such a place in my life? 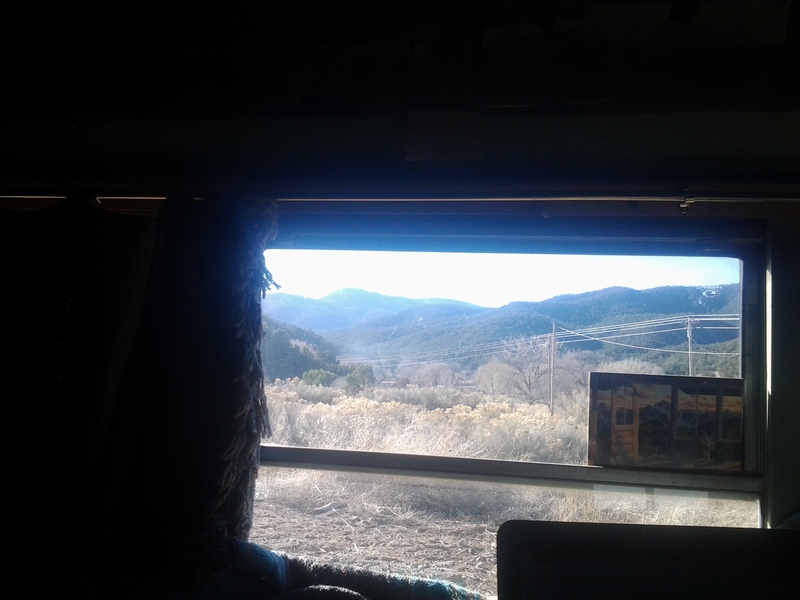 I know that same spot and I have been there since my youth, the cabin where Sam lived, hidden in the hills of New York, the cabin of my own in Hunters, Washington, and the log homestead cabin in the Capitan Gap, New Mexico where I raised my children. Later, the place I still have, my Nogal House on the Vera Cruz, where I could go now if there was not so much to do…..though go I may just because I should! In fact I will go tonight if my truck is fixed as that is all that could keep me from doing so. A picture post card. How can one small piece of card stock hold so much of my dreams in such a small space? It almost oversimplifies it as there are no excuses left when I gaze on the image I have treasured for so long. This card, tucked away in a notebook from three years ago, remembered often enough and stored beside my bed where I have slept most every night, but hidden from my view. I will leave it plain sight now, as it was before I left Nogal, a constant reminder of everything which is most precious to me. If my words rein me in the picture will give the added focus I require, the direction I sometimes fail to follow. It isn’t that I have not been true to that purpose but only that it is taking me too long to get there, my path should be more direct and with the end in sight it will be, the ache in my heart will allow for nothing less! The view out of my window is near the equal of the picture, I can see this now. It is even closer when I stand in the doorway of the Nogal House but I cannot afford to live there, not now, not yet. I have made it work for certain, my words from three years ago reflect so much of that and I was, in some ways, closer to the dream then than I am now. In the physical sense it was wholly there, the serenity was complete and the light which streamed in through my windows and doors was much the same. I have that here also but to a lesser degree, my neighbors and my worries are too close and a constant reminder of the effort of my quest. Perhaps it has been worth the sacrifice and it has brought me closer to that goal but I see now the failing in the logic also. Long term is not an option; it is the here and now which counts the most! It took a worn, old picture post card to remind me of that and it is a lesson it will not allow me to forget.